RESTART OF UFFMM AS SCIENTIFIC WORKPLACE. This is a complete new restart of the old uffmm-site. It is intended as a working place for those people who are interested in an integrated engineering of the future. A widely known and useful concept for a general approach to the engineering of problems is systems engineering (SE). Open for nearly every kind of a possible problem does a systems engineering process (SEP) organize the process how to analyze the problem, and turn this analysis into a possible design for a solution. This proposed solution will be examined by important criteria and, if it reaches an optimal version, it will be implemented as a real working system. After final evaluations this solution will start its carrier in the real world. In a meta-scientific point of view the systems engineering process can become itself the object of an analysis. This is usually done by a discipline called philosophy of science (PoS). Philosophy of science is asking, e.g., what the ‘ingredients’ of an systems-engineering process are, or how these ingredients do interact? How can such a process ‘fail’? ‘How can such a process be optimized’? Therefore a philosophy of science perspective can help to make a systems engineering process more transparent and thereby supports an optimization of these processes. A core idea of the philosophy of science perspective followed in this text is the assumption, that a systems engineering process is primarily based on different kinds of actors (AC) whose interactions enable and direct the whole process. These assumptions are also valid in that case, where the actors are not any more only biological systems like human persons and non-biological systems called machines, but also in that case where the traditional machines (M) are increasingly replaced by ‘intelligent machines (IM)‘. Therefore the well know paradigm of human-machine interaction (HMI) — or earlier ‘human-computer interaction (HCI)’ will be replaced in this text by the new paradigm of Actor-Actor Interaction (AAI). In this new version the main perspective is not the difference of man on one side and machines on the other but the kind of interactions between actors of all kind which are necessary and possible. The concept of intelligent machines (IM) is understood here as a special case of the general Actor (A) concept which includes as other sub-cases biological systems, predominantly humans as instantiations of the species Homo Sapiens. While until today the question of biological intelligence and machine intelligence is usually treated separately and differently it is intended in this text to use one general concept of intelligence for all actors. This allows then more direct comparisons and evaluations. Whether biological actors are in some sense better than the non-biological actors or vice versa can seriously only be discussed when the used concept of intelligence is the same. 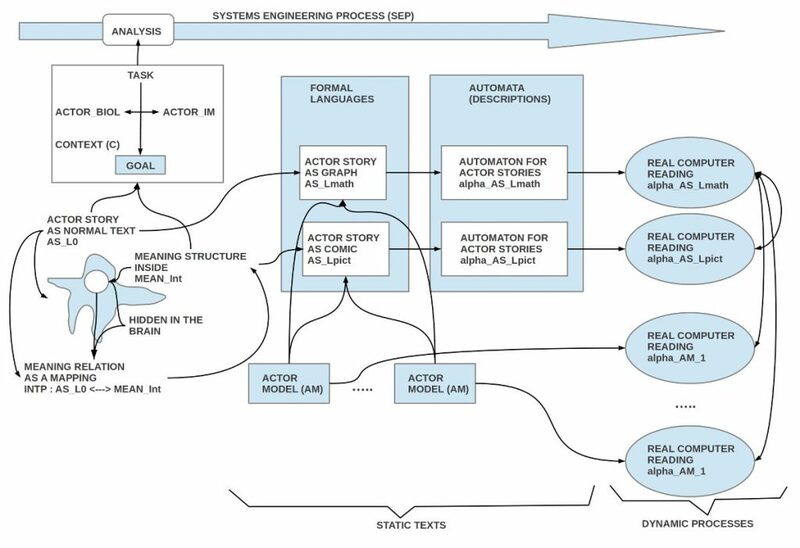 And, as it will be explained in the following sections, the used paradigm of actor-actor interactions uses the two main concepts of actor story (AS) as well as actor model (AM). Actor models are embedded in the actor stories. Whether an actor model describes biological or non-biological actors does not matter. Independent of the inner structures of an actor model (which can be completely different) the actor story is always completely described in terms of observable behavior which are the same for all kinds of actors (Comment: The major scientific disciplines for the analysis of behavior are biology, psychology, and sociology). In analogy to the so-called ‘Object-Oriented (OO) approach in Software-Engineering (SWE)’ we campaign here the ‘Actor-Actor (AA) Systems Engineering (SE)’ approach. This takes the systems Engineering approach as a base concepts and re-works the whole framework from the point of view of the actor-actor paradigm. AASE is seen here as a theory as well as an domain of applications. To understand the different perspectives of the used theory it can help to the figure ‘AASE-Paradigm Ontologies’. Within the systems engineering process (SEP) we have AAI-experts as acting actors. To describe these we need a ‘meta-level’ realized by a ‘philosophy of the actor’. The AAI-experts themselves are elaborating within an AAI-analysis an actor story (AS) as framework for different kinds of intended actors. To describe the inner structures of these intended actors one needs different kinds of ‘actor models’. The domain of actor-model structures overlaps with the domain of ‘machine learning (ML)’ and with ‘artificial intelligence (AI)’. What will be described and developed separated from these theoretical considerations is an appropriate software environment which allows the construction of solutions within the AASE approach including e.g. the construction of intelligent machines too. This software environment is called in this text emerging-mind lab (EML) and it will be another public blog as well. Because the overall framework of the intended integrated theory is too large to write it down in one condensed text with all the necessary illustrating examples we decided in Dec 2017 to follow a bottom-up approach by writing primarily case studies from different fields. While doing this we can introduce stepwise the general theory by developing a Micro Edition of the Theory in parallel to the case studies. Because the Theory Micro Edition has gained a sufficient minimal completeness already in April 2018 we do not need anymore a separate template for case studies. We will use the Theory Micro Edition as ‘template’ instead. To keep the case studies readable as far as possible all needed mathematical concepts and formulas will be explained in a separate appendix section which is central for all case studies. This allows an evolutionary increase in the formal apparatus used for the integrated theory. Here you can find the actual version of the theory which will continuously be updated and extended by related topics. At the end of the text you find a list of ToDos where everybody is invited to collaborate. The main editor is Gerd Doeben-Henisch deciding whether the proposal fits into the final text or not. This sections describes basic assumptions about the cognitive structure of the human AAI expert. This sections describes main developments in the history from HCI to AAI. The Milestone for a first outline in a book format has been reached June-22, 2018. The milestone for a first final version is scheduled for October-4, 2018.